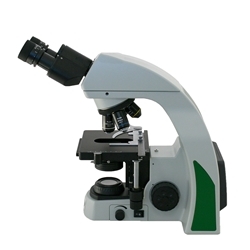 The Richter Optica U2B binocular high power laboratory biological microscope offers high quality optics at an affordable price point. View the trinocular version of this microscope here. Eyepieces: Widefield High Eyepoint Focusing 10x eyepieces / FN 20mm. Binocular Siedentopf viewing head with 30° inclined binocular eyepiece with interpupillary adjustment 50mm to 75mm. Eyepiece can hold a 20mm diameter reticle if reticle retaining ring is added. 0.4" scale numbered 0-40, each division 0.1"
0-10 has 10 divisions = 0.1"
10-20 has 5 divisions = 0.02"
20-40 has 4 divisions = 0.05"
Warranty: 5 Year warranty, excluding bulb, cord and fuse. Includes: Dust Cover, lens cleaning paper.